The Atlas Copco Oil Filter Replacement - 1614874799 facilitates consistent surface area control through strict maintenance of pleat quantity and depth. Produced with top-of-the-line materials, the Atlas Copco 1614874799's high-grade filter media allow for acquisition of specific filtration levels. The Atlas Copco 1614874799 includes a 10.50 / 40.00 gal/L per min. capacity and 1 - 12 m3/m thread. 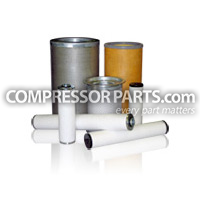 This filter is a low-priced substitute for the Atlas Copco 1614874799 that matches OEM standards.